The Amazon DynamoDB is a NoSQL database that can provide you with fast performance as well as scalability. This tool can also be used for the storage or retrieval of voluminous data. All your data is stored on a Solid State Disk or SSDs in order to provide high availability. Your data is also replicated across several availability zones. The Elastic Cloud Gate user interface allows you to explore and manage Amazon DynamoDB in a quick and easy manner. It gives you an easy and fast way to edit, add or delete records in your DynamoDB table. 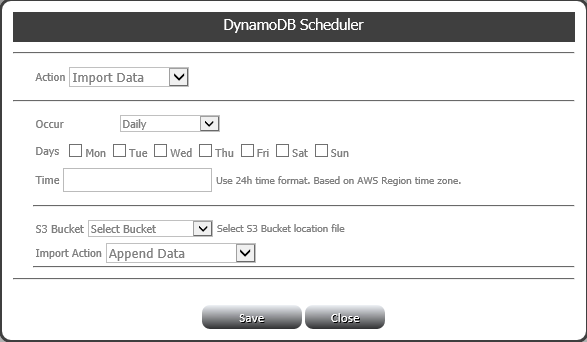 DynamoDB backup is also an added feature of the Elastic Cloud Gate. It is a perfect tool for the backup and restoration of your DynamoDB tables. We provide an option to import or export DynamoDB data to or from csv files. Aside from allowing you to import and export your data immediately, you can also schedule it as a regular task. The scheduler enables the task to be executed on an hourly, daily or monthly basis. In addition, you can also chart your DynamoDB metrics in order to monitor the utilization as well as the performance of your database. With the Elastic Cloud Gate, monitoring and tracking your database’s performance is now easy and more convenient.